World champion Aaron Gate has a fight on his hands in an exciting men’s omnium contest at the UCI Oceania Track Cycling Championships in Invercargill. Gate lies in a share of third place as four riders pushed clear of the field in the first day of the two-day, six-discipline event at the SIT Zero Fees Velodrome. London Olympian Shane Archbold and Australia’s Luke Davison lead on seven points each, with Gate sharing third with fellow Kiwi Dylan Kennett on nine points. Meanwhile the commissaries were hard at work in a controversial final of the men’s keirin, finally awarded to Australian Matthew Glaetzer after initially relegating the Australian in favour of New Zealand sprint star Eddie Dawkins. There were no close calls or drama in the women’s omnium where Australia’s London Olympic medallist Annette Edmondson was classy in winning all three events on the first day of the women’s omnium. The men’s omnium began with a superb effort from 18 year old Kennett who topped times in the men’s 200m flying lap with his time of 12.894 secs the second time he has gone under the 13 second barrier this week. Only Olympic champion Ed Clancy from Great Britain has gone faster with the pair the only riders to better the 13-second barrier in an omnium. He finished ahead of compatriots Shane Archbold and Cameron Karwowski, with Gate only fifth. Gate showed his absolute class to lap the field twice on the way to winning the 30km Points race with 53 points from Davison and Archbold. Davison edged out Archbold in the final sprint of the exciting elimination race with the pair now sharing first place overall midway through the contest. Gate, who was out in the previous sprint, is in a share of third place with Kennett on nine points to set up an exciting second day that comprises the 4000m individual pursuit, scratch race and 1000m time trial. The men’s keirin final was stopped after three laps before officials disqualified Australian Jacob Schmid, the former junior world champion, for pushing up and impeding local Southland sprinter Matt Archibald. In the re-run Eddie Dawkins pushed around the field into the lead after being forced wide by Australian Emerson Harwood, who then re-took the lead. The big Kiwi forced his way to the front on the final lap and appeared to be pipped by Australian Olympic medallist Matt Glaetzer in a frantic sprint to the line. Initially the judges relegated Glaetzer for riding in the blue lane at the bottom of the track, and awarded the result to Dawkins, but on review by the chief judge, Southland’s Jeremy Presbury was ruled to have forced Glaetzer into the no-go blue lane and the Australian was reinstated. “It was a very hectic race. For the last lap and a half it was pretty much survival for me,” said Glaetzer. Dawkins was pleased with his performance and not undeterred by the final decision. “The race was good, a bit messy and the infringements changed the course of the race quite a bit.” he said. “The Aussies love going long and love putting the hurt on early and it makes for an interesting race for the riders and the spectators. That’s what we want and that’s what they got. Edmondson was in dominant form in the women’s omnium, winning all three events. She clocked 14.184 to win the 200m flying lap, accumulated 49 points to beat off the challenge from Kiwi Olympian Jaime Nielsen in the points race, and cruised clear of compatriot Georgia Baker to win the elimination. The exciting men’s 30km points race was a successful return for Southland road racing professional Tom Scully, winning comfortably from Australian Miles Scotson and another local rider, Pieter Bulling. In under-19 racing, talented Cantabrian Olivia Podmore and Australian Max Housden won the sprint finals, both in two straight rides. The Australians proved far too strong in the team pursuit, catching the New Zealand combination, while Alexander Porter (AUS) claimed the 10km scratch race. The final day of the championship features the men’s and women’s sprint, the conclusion of the omnium and finishes with the traditional and spectacular men’s Madison. Men, Keirin semifinal 1: Matthew Glaetzer (AUS) 1, Matt Archibald (NZL) 2, Jeremy Presbury (Southland) 3. Semifinal 2: Eddie Dawkins (NZL) 1, Emerson Harwood (AUS) 2, Jacob Schmid (AUS) 3. Seventh-12th: Tom Beadle (Southland) 1; Simon van Velthooven (NZL) 2, Ben Young (AUS) 3. Final: Glaetzer 1, Dawkins 2, Archibald, 3. Omnium, Flying Lap; Dylan Kennett (NZL) 12.894, 1; Shane Archbold (NZL) 13.133, 2; Cameron Karwowski (NZL) 13.190, 3. Points race: Aaron Gate (NZL) 53 points, 1; Luke Davison (AUS) 26, 2; Archbold 25, 3. Elimination: Luke Davison (AUS) 1, Shane Archbold (NZL) 2, Aaron Gate (NZL) 3. Points after three rounds: Archbold and Davison 7 points, equal 1; Kennett and Gate 9, equal 3. Points race 30km: Tom Scully (Southland) 33, Miles Scotson (AUS) 24, Pieter Bulling (NZL) 16. Omnium, Flying Lap: Annette Edmondson (AUS) 14.184, 1; Jaime Nielsen (NZL) 14.772, 2; Lauren Ellis (NZL) 14.968, 3. Points race: Edmondson 49 points, 1; Nielsen 40, 2; Racquel Sheath (NZL) 3. Elimination: Edmondson 1, Georgia Baker (AUS) 2, Ellis 3. Points after three rounds: Edmondson 3 points, 1; Nielsen 8, 2; Ellis 10, 3. Women Sprint Semifinal 1: Olivia Podmore (NZL) bt Bryony Botha (Auckland) 2-0; Semifinal 2: Kate Stewart (NZL) bt Nina Wollaston (NZL) 2-0. Third-Fourth: Botha bt Wollaston 2-1. Final: Podmore bt Stewart 2-0. Men Sprint Semifinal: Nick Kergozou (NZL) bt Quinn Karwowski (NZL) 2-0; Semifinal 2: Max Housden (AUS) bt Jordan Castle (West Coast NI) 2-0. Third-Fourth: Karwowski bt Castle 2-0. Final: Housden bt Kergozou 2-0. Men 4000m Team Pursuit: Australia 1, New Zealand 2 (caught). Men Scratch Race 10km: Alexander Porter (AUS) 1, Matthew Jackson (AUS) 2, Nick Kergozou (NZL) 3. 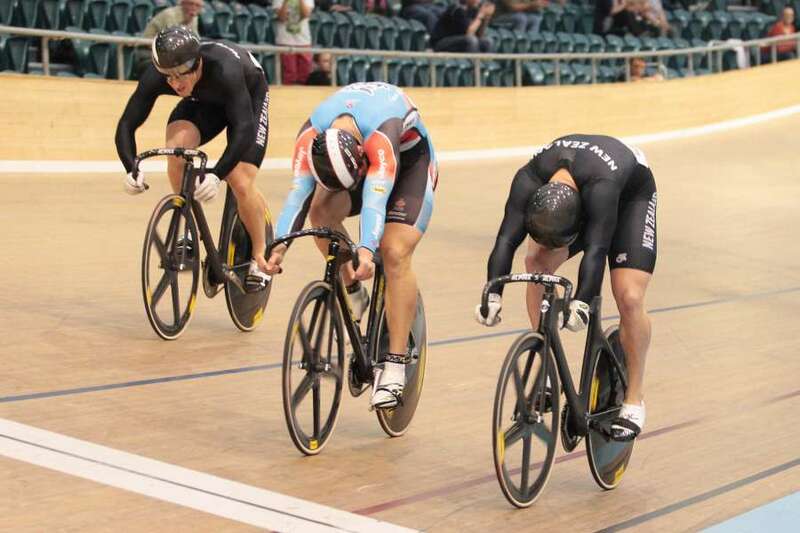 CAPTION: Matthew Glaetzer (AUS) on the left edges local star Eddie Dawkins in the men’s keirin final.